When I begin a new course for pregnant women, I tell them that they are, in fact, in a normal Yoga class. But, since Yoga needs to be adapted to support the needs of each student, the classes we do together will be Yoga adapted for people who are pregnant. Then, a few years later, I was pregnant for a second time. I could do NOTHING….. for 9 months, and I realized I had no idea what I was doing for prenatal Yoga! Literally, doing more than the minimum amount of movement to function left me feeling ill and completely depleted. There were no long focused Yoga practices, no deep breathing, no focused visualizations. 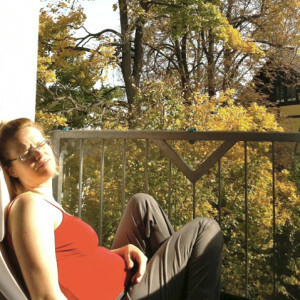 The farthest I managed to move my body in that pregnancy was to a Yoga retreat with my teacher, Mirka Scalco Kraftsow, where I mostly laid on my Yoga mat if I managed to make it to a session at all. She was gentle, nurturing and helped me find small reserves of energy. She also reminded me to be gentle and stop pushing to ‘do’ something because it was so far beyond my control. Non-doing was the experience of the pregnancy. In fact, that daughter’s name means, basically, “the wisdom that comes by surrendering to that which is greater than yourself” (yes, it was that bad). Now, those are only two pregnancies experienced through the same woman. This does not even begin to touch upon the incredible variability in the process of bringing another person into the world through one’s own body. Women can be disablingly sick or running races throughout pregnancy – this human experience is truly vast. So, when we teach ‘Prenatal Yoga’, it is, of course, important to study and understand the anatomy and physiology of the process of pregnancy and birth, but it is vital to teach to the woman as she is in her totality. In a process that changes day to day, the most important gift we can offer pregnant women, especially those new to Yoga, is the practice of returning to a place where they can observe and connect with themselves. This is the work of the mother, even before the child (or children) comes into the world. I have seen many ‘Prenatal Yoga’ tips that focus almost exclusively on postures, so I thought it was important to share the main aspects I think are far more important than any specific Yoga Asana or sequence. Asana is important for those who are able, but by no means the end-all be-all of Yoga at this time of life – they are simply a tool to support the process. In the transition to motherhood (for the first or multiple times), the Earth shifts under your feet – Yoga helps you find your footing. There are volumes written about anatomy and physiology of pregnancy, and they are written to a variety of audiences, and there are now many Yoga trainings designed especially for teaching pregnant women. Educate yourself, and if you aren’t sure where to start, ask a trusted teacher with experience. There are things happening in the bodies of all pregnant women that are common, and they manifest as typical pregnancy conditions which you should know about. You are not a doctor responsible for understanding all conditions that may manifest, but being conversant in the language of the process will not only support how you teach, it will help you support the students who may look to you to help their own understanding of this life altering new experience. This, naturally, will inform what kind of activities you can ask your students to perform, but more importantly, it will help you tune in to the aspects of their experience that may not be as obvious from the outside. What is it like today? This is an important question in a time when some feel like they are living in someone else’s body. For any Yoga class or practice, being grounded and connected to the present moment is important. For students who try Yoga for the first time during pregnancy (the majority of my students), this is the biggest take-away from the classes. Simple techniques that they can do at home to help them return to a state of relative ease can be big hits (Clare Collins, a brilliant Yoga teacher who supported me through my two pregnancies, calls them “yoga snacks”). I’ve had students teaching their partners techniques of mantra and simple breathing to help them be better partners during stressful moments as the baby comes into the world. Simple tools become like an anchor through an experience that shifts like the wind. Ask them to observe themselves and then listen to what they tell you about their experiences – a standard for Yoga teaching in general, but extremely useful in this context. Even though it is natural and amazing…… OMG! Each woman comes to these realizations in their own time, so this is why we check in to each day’s experience. Not every woman feels comfortable or happy at every stage, and in some cases, past experiences may arise or need to be addressed. One of the advantages of having a class exclusively for women during pregnancy is that the sharing can be therapeutic and supportive because everyone is in a similar place. Additionally, when you are pregnant, not only are you processing your own thoughts on what it means, you are often asked to also listen to everyone else’s opinions on what it means. I have found that once your uterus is occupied, everyone has an opinion about it (I won’t even get into the politics of that statement). Pregnant women hear from everyone, often with the best intentions, about what they should do or feel. In the space of a Yoga class, it is important to give them a break from that kind of judgment, no matter how well intentioned. The image sold to us in the media of pregnancy is a beautiful, healthy young woman who just radiated joy and motherliness. For all women, this one dimensional image is just simply not reality. In addition to issues like body image that arise in any Yoga class, when working with pregnant women, the dynamics of family and motherhood are also there among many other complexities of the human experience. This complexity is often washed away with people’s wish to celebrate the coming arrival, leaving a woman feeling isolated with any normal negative thoughts she may have. A prenatal class can become a powerful Sangha with the potential to build bonds that last years; bringing women together in the beauty of this powerful journey is an added bonus of these classes. I remember taking birthing classes in the first pregnancy and being pretty surprised that fear or dealing with fear was not part of the program. The same was true for many books I browsed for birth preparation (my favorite books dove into the reality of pain and fear). Fear of pregnancy and child birth are normal, and Yoga is the best tool available to help with something this powerful. Part of the washing away of the complexity of the woman’s experience in lieu of celebrating the arrival of a baby is to ‘stay positive’ or avoid anxiety. However, this can leave some women without an outlet to process their fears. Find out who your students are and support them – again, a good approach to any Yoga class. Give space to women in class or after (in a less formal setting) to be able to ask and express fears and uncertainties. Pregnancy is one powerful series of experiences in the life of a woman. Her life did not begin there and will most likely not end there. Teaching women who are pregnant is not in isolation of her life experiences, so topics of birth and postpartum periods come up naturally. Be ready for that as well in your research. Another popular kind of ‘yoga snacks’ for my students have been ones that women can take into the postpartum period. I live in a country where every woman is visited by a midwife for the first ten days (at least) after birth to check on her and the baby’s well being. But even with the kind of excellent postpartum care, many women feel lost, so having a little Yoga snack that connects them with themselves and their newly found community of new mothers is a true gift. Respecting the spectrum yields the most benefit to the students because pregnancy does not happen in isolation from life – we live in a web of events all interconnected in this moment. Even though birth is an exponentially more powerful experience than experiences in everyday life, it can also be supported with simple Yoga tools like the kind you bring in to each class. As one student most recently reminded me, labor and birth can be one of the most powerful meditation sessions one experiences in her whole life, but THAT is a topic for another article. Tammy Bosler is a recovering astrophysicist and professional human being. When she is not practicing and teaching Yoga in Regensburg, Germany, she is working as an apprentice/tech support/logistics for the amazing Mirka Scalco Kraftsow (www.viniyogalife.com). 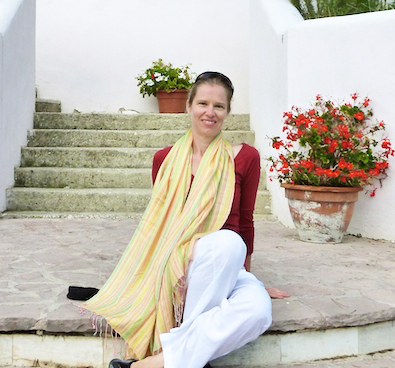 Tammy and her husband also created the YogaDigital app for iOS last year, and are slowly building it as a resource for students looking for digital content to support their home practice. Tammy was certified and trained by Gary and Mirka Kraftsow and teachers at the American Viniyoga Institute (RYT-500), and this is the primary approach to Yoga she has used for the past 16 years or so. 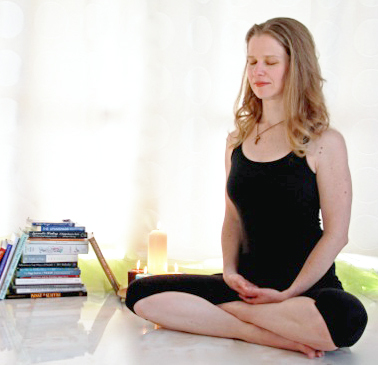 In addition to continuing education in Yoga, she spends a significant amount of time with two little Zen masters ages four and six years who are constant reminders to be attentive to the present moment – they are relentless teachers. Thanks ~ this is so useful as a prenatal yoga teacher and mother. My pregnancy was spiritually challenging but it did make a fertile (if you will!) grounds for applying yoga in the philosophical sense, which I welcomed. While I was pregnant I felt like I connected effortlessly with my prenatal students; in the past year postpartum I haven’t always felt confident that I’m relating to what they go through. It helps me to receive reminders like this, that every body and experience in each pregnancy is unique and it’s not my “job” to have the answer to every ailment. To give that opportunity to the student instead, which will serve them so much better! The yoga snack I remember using after birth was practicing alternate nostril breathing while nursing (; I think I’ll offer that idea to my class tomorrow! Yes! Yoga snacks are beautiful – the simplicity of returning to that place of peace. great to read an article of yours here! Thank you for sharing, what an interesting topic.